I used the recipe from Baking Bites's Sugar Doughnut Muffins, adapting it to use butter, buttermilk and baking soda instead of baking powder. The baking time and temperature were adjusted. I also omitted the ground nutmeg, as I wanted a pure butter/vanill-y type cake doughnut. 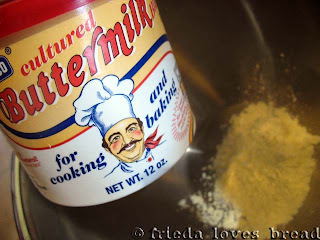 Buttermilk makes everything better. If you don't have this fabulous powdered stuff, feel free to use the real liquid stuff or sub with sour milk (1 T.+ enough milk to make 1 cup). 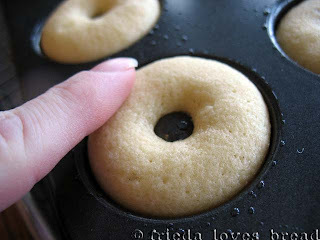 Tovolo makes this nifty Cake Pen (Here, too) that works fabulously with the mini-doughnut pan. Other readers have suggested a ketchup bottle, cake decorating bag with large tip, or even a Ziploc baggie with the corner cut off. 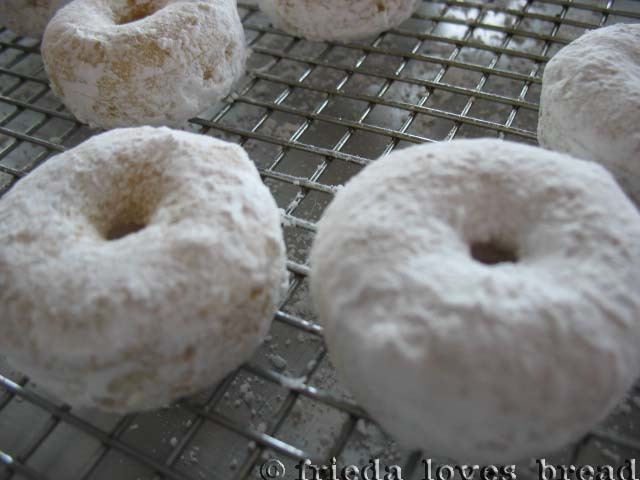 Tapped the excess and put them on a rack and then decided to "double dip" them again in more powdered sugar! 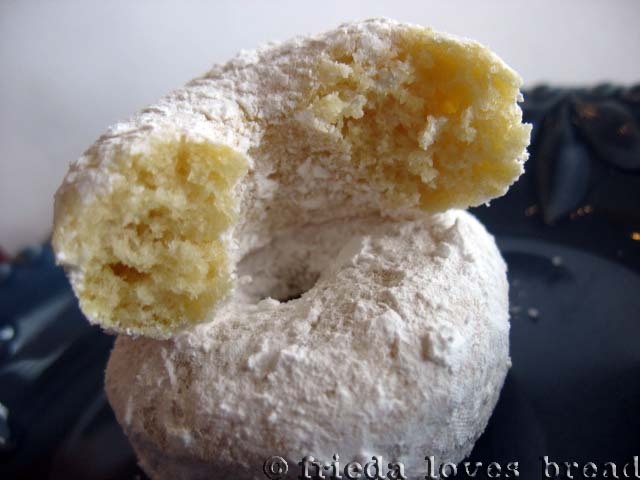 *Note: these doughnuts are best eaten right away. And I mean right away. 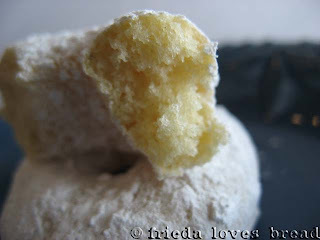 This is what happens when covered doughnuts are stored in an air tight container. The moisture from the doughnuts seem to have absorbed most of the powdered sugar. Not to worry, I dipped them again. These doughnuts freeze well plain, with no glaze or powdered sugar. Just thaw out, dip, and enjoy! Yumm! I need to make these. Great ideas. My mouth is watering! 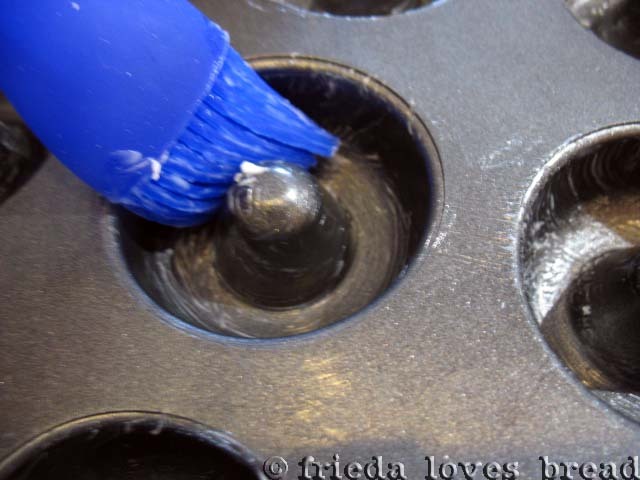 Wish I hadn't lost my donut pan! They're still going on my "gotta cook" list... pan or not. :-) Thank you. I am not really a donut girl. But these look so fun to make I might have to change my mind. Mmmmmm....I've made a few baked doughnuts before http://burntapple.wordpress.com/2010/05/14/300-calorie-dessert-challenge-baked-doughnuts/ but like the variations in your vanilla doughnut recipe. Thanks for sharing!! I love my mini doughnut pan. It's so much fun! Oh yum!!!! I will have to try these this weekend. Thank you! I will definitely have to make these for my husband sometime soon. 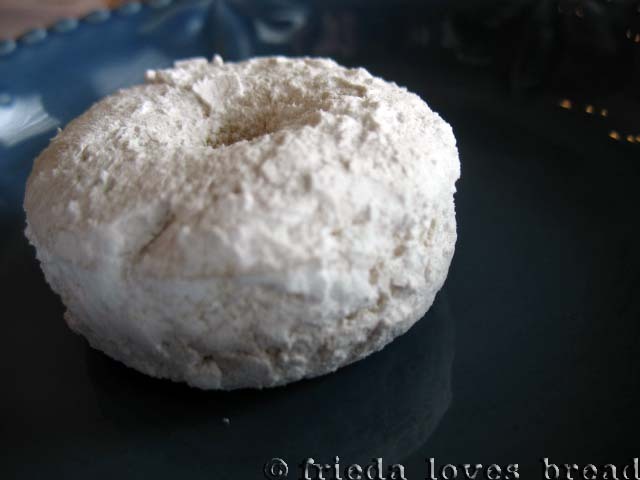 One of his favorite memories is of his grandma making cake donuts covered in powdered sugar. I tried making some years ago, but they were fried and I really don't like that "Kitchen covered in oils" feel when deep frying. Maybe it's time for me to try making them in the oven instead! I would like to make your recipe but would like to know the measurement and timing, you adjusted to.. "I used the recipe from Baking Bites's Sugar Doughnut Muffins, adapting it to use butter, buttermilk and baking soda instead of baking powder. 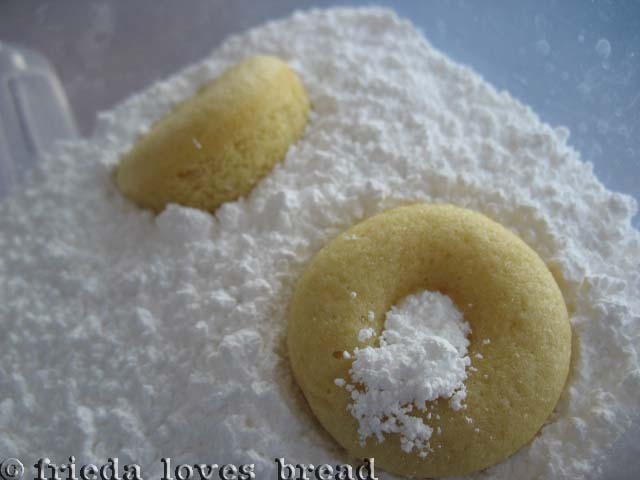 The baking time and temperature were adjusted." Oliemommy, you can find my recipe (4x6 and full page printable) just above these comments in a link. The recipes there are the adjustments that I used. 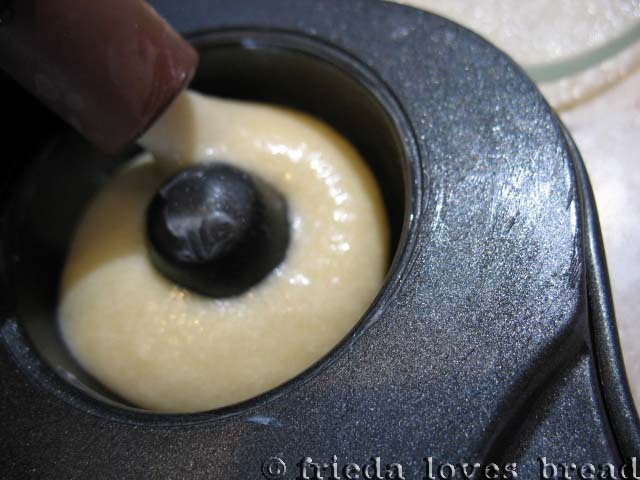 If you want to compare the two recipes, click on Baking Bite's link in the second paragraph. Good luck and have fun! I love your doughnut pan!! I had never seen one before and then a few weeks ago I saw one on someone else's blog. 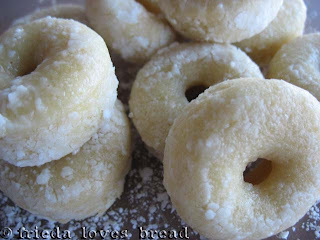 I love the idea, baked doughnuts instead of fried. I have to get myself one of these, your doughnuts look SO good! So cute!! Not a doughnut girl myself but they look really tasty , maybe if i made it myself, i would eat!